A few weeks ago I started to make my own sauerkraut. 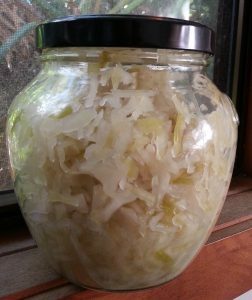 Sauerkraut is incredible because it has heaps of health benefits, it’s very easy to make and it’s super cheap! I know that sauerkraut is not for everyone because of its smell and its sour taste. Well, sauerkraut is just finely chopped fermented cabbage, which is the reason for its sour taste. I certainly didn’t like sauerkraut much as a kid but it contains a lot of benefits for your body. So I’m glad that my parents forced me to eat it every now and then. Unlike most people think, sauerkraut isn’t a German “invention”. Sauerkraut originates in China where it was fermented in rice wine. Chinese labourers building the Great Wall over 2000 years ago ate it as a standard meal. It is said that migrating tribes then brought it over to Europe. Basically sauerkraut is just fermented cabbage but it’s a superfood. Thank god some marketing guru came up with this word! But seriously, it has a lot to offer for your overall health. Sauerkraut can boost your circulation, it can protect your heart, increase your digestive health, provide you with quick energy, boost your immune system, strengthen your bones, reduce your cholesterol levels and control inflammation. Apparently sauerkraut can even improve your vision and skin health as well as protect against certain cancer. Woo, if that isn’t something?! However, be aware that sauerkraut is also high in sodium because it’s fermentation in salt. This might cause health problems for some people! What is so special about fermented food? Fermentation is an ancient method of preserving food by naturally altering the chemistry of it. In case of sauerkraut, the process of fermentation produces a lot of beneficial probiotics which has positive effects on your digestive tract and ultimately on the rest of your body too. That is because a large part of our immune system actually lives within our intestinal flora and is run by bacterial organisms. So when consuming microorganisms from probiotic food these beneficial bacteria take up residence in your intestines where they act as a first line of defence against harmful bacteria and toxins. Some of these good bacteria found in sauerkraut can even be long term residents because they form long-lasting colonies. The sauerkraut fermentation process is called lactic acid fermentation or “pickling” to put it in more simpler terms. Lactic acid bacteria like lactobacilli are driving the fermentation. These lactobacilli occur and grow naturally on raw cabbage since they’re airborne bacteria. When submerged in brine, lacto-bacilli cause the pH to reduce which makes the environment acidic and therefore unsuitable for the growth of harmful bacteria. Sauerkraut has high levels of dietary fiber. It is also rich in numerous vitamins like A, C, K and various B vitamins. In addition to that sauerkraut is a good source of iron, manganese, copper, sodium, magnesium and calcium. It even provides us with a small amount of protein. Sauerkraut is available everywhere these days, so why would you get your hands dirty and make it yourself? Because the sauerkraut which you can buy in conventional supermarkets most likely contains additives like preservatives or sugar. Also, store-bought sauerkraut is usually pasteurised which means that the heat has killed most of the healthy probiotics. Eating store-bought sauerkraut is therefore pretty pointless unless you try organic supermarkets or farmers markets. I know that some farmers in Germany are selling sauerkraut straight from the barrel in which it was fermented in. It doesn’t get any fresher than that unless you make it yourself! Sauerkraut is really easy to make and there is also not a lot that can go wrong. You also don’t need fancy equipment or ingredients because you will most likely have everything sitting at home in your kitchen already. Simply buy some fresh cabbage next time you’re at the farmer’s market or supermarket and start fermenting! Depending on how much sauerkraut you want to make you can vary the amount of cabbage and adjust the amount of salt accordingly. I usually only use a quarter of a cabbage. Preserving jars, mason jars, jam or pickle jars, etc. Cloth or glad wrap for covering the jar (optional). Before we start, clean everything! Fermenting is all about the good bacteria so make sure your jars are clean, perhaps rinse them with boiling water to get rid of any bacteria. Make sure the rest of the equipment is clean too as well as your hands because you will be using them for massaging the salt into the cabbage. 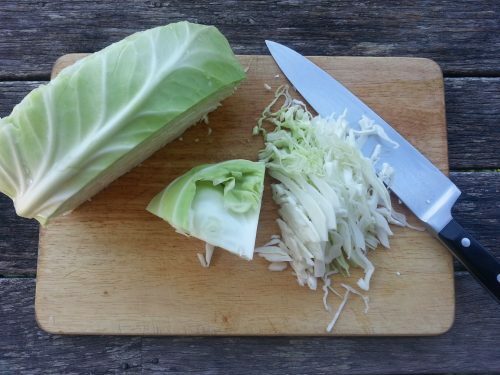 Chop the cabbage finely. Discard wilted leaves and get rid of the core. If you have a lot of cabbage it’s probably wise to use a food processor. Transfer the sliced cabbage into a large mixing bowl, add the salt and start working the salt into the cabbage with your hands. You can also use a potato masher but I find that using my hands works best. Slowly the salt will force the liquid out of the cabbage and the cabbage will become watery. This can take 10 to 15 minutes. Now pack the cabbage into your prepared jars. I like using kitchen tongs for this but you can also just use your hands or a spoon. Make sure to press the cabbage tightly and also to pour all liquid in the jars too. Close the jar with their lids. You can add a layer of glad wrap between lid and jar to secure it even more but this is optional. If after 24 hours the liquid has not risen above the cabbage, add some extra liquid. Simply dissolve 1 teaspoon of salt in 1 cup of water and add enough to submerge the cabbage. While the sauerkraut is fermenting keep it away from direct sunlight and at cool room temperature. Smaller amounts of sauerkraut will ferment quicker than larger batches. You can start tasting your sauerkraut after 3 days or leave it fermenting for 10 days or longer. There are no real rules here. 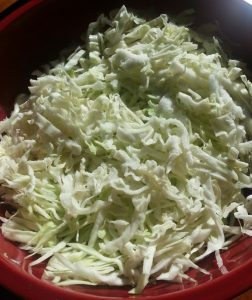 While the sauerkraut is fermenting, you will see bubbles coming through the cabbage, perhaps foam on top of it or white scum. These are all good signs! Simply skim the scum off the top and continue fermenting. If you see any mould, skim it off right away and make sure the sauerkraut is submerged. Don’t eat any mouldy parts! Store your sauerkraut in a cool place. The fermented sauerkraut will keep for a couple of months or even longer if you refrigerate it. 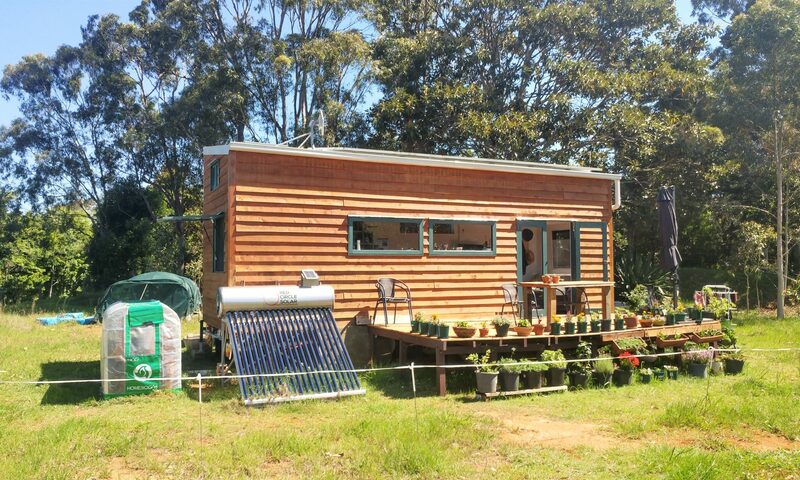 Next PostNext The benefits of double glazed windows and why they also make sense in Australia!